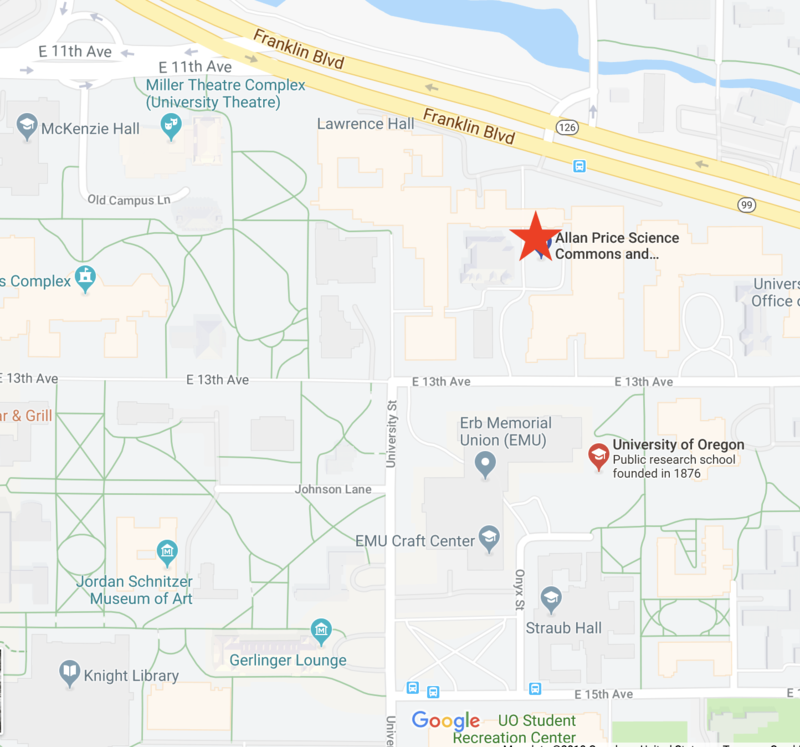 The UO Owns a 50-Million-Pixel Screen. Here’s Why You Should Use It. Thank you for joining us on the DH@UO blog! 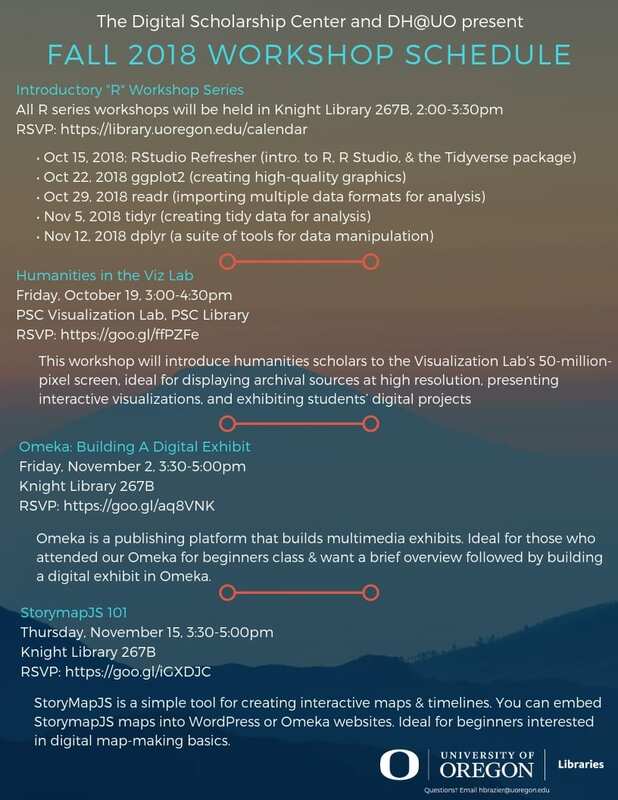 On Friday, October 19 at 3:00pm, we are co-hosting a workshop in Price Science Library’s Visualization Lab (“Viz Lab”). Our Humanities in the Viz Lab workshop will introduce faculty and graduate students to the Lab’s massive 50-million-pixel screen. We sat down with Price Science Commons Visualization’s Lab Specialist and PhD candidate Courtney Floyd, who convinced us that we should run to the Viz Lab pronto to see how amazing our texts appear projected on the giant wall. 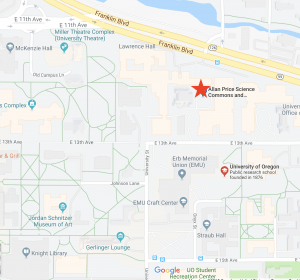 DH@UO: What’s the significance of having the Viz Lab at UO? Courtney Floyd: The Viz Lab enables us to study materials in unusual ways by enlarging and projecting them on an enormous wall. The room’s technology capabilities display images at an extraordinarily high-resolution (50-million-pixels), which helps us to see finer details—and data—than what we might see on our computer screens. Those who have experienced the lab have been amazed at the nuance and detail in images they’ve been studying for years. The Viz Lab is also amazing because it fosters engaged collaborative work in the classroom. Students can work in groups to view, manipulate, and annotate images. Instructors have used this tool to help their classes think about images at the start of a new project or to invite engaged classroom discussions and investigations mid-way through a unit. 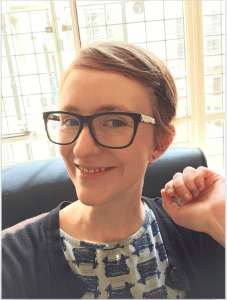 DH: How do you envision scholars, humanities-based in particular, using the Lab? Similarly, instructors will find the Viz Lab to be a space to create and advance our thinking about an argument or text in collaborative, interactive ways. The Viz Lab changes the way you interact with your data, whether you’re shifting from looking at medieval manuscripts to working with high resolution scans of their pages or shifting from viewing a spreadsheet on a 13-inch laptop screen to a spreadsheet on the Viz Wall. Even if you don’t think of your data / research as visual, the Viz Lab is a resource worth exploring. But you don’t have to take my word for it! Come see for yourself. 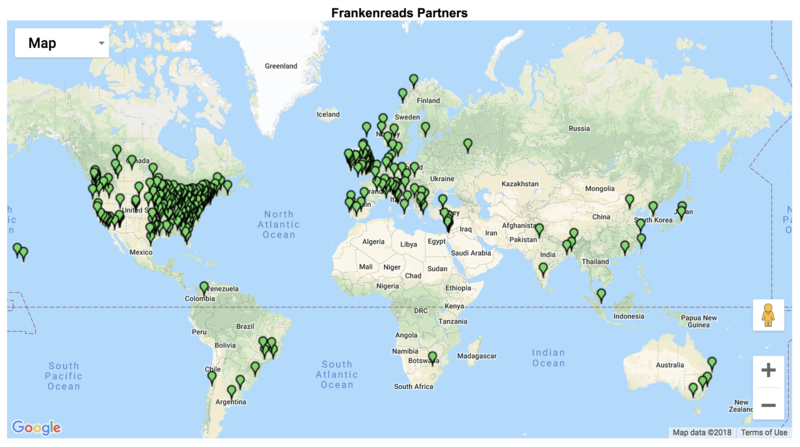 The Frankenreads event is a great way to learn about the space, but I am also happy to schedule tours and provide project consultations. DH: Tell us a little about your upcoming event, Frankenreads ? 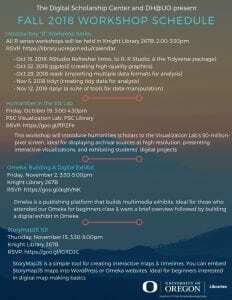 DH: Why is it beneficial for DH enthusiasts to attend both the Humanities in the Viz Lab workshop and the Frankenreads events? Thank you, Courtney, for sitting down with us! If you’ve never even thought to use this amazing resource, simply reach out to Courtney. She’s eager to show new people how they can integrate this tool in courses and research projects. We hope to see you at both the Humanities in the Viz Lab and Frankenreads events. And while you are filling in your fall calendar, please consider attending our other DH workshops, which are free and open to the public. You can see a list of our workshops by browsing the flyer below or visiting the “Workshop Series” tab on our website.